Great Uncle Hamish had a robust attitude to hedging. His mantra was “Plant thorns. Nothing else keeps out the tourists.” Few, if any tourists ventured across the drenched moorland to the boundaries of castle Tavish, but Great Uncle Hamish kept his hedges in top condition, just in case. Most of my hedging is beech, as wind is more of a problem here than tourists will ever be, and beech is a better windbreak than thorn. 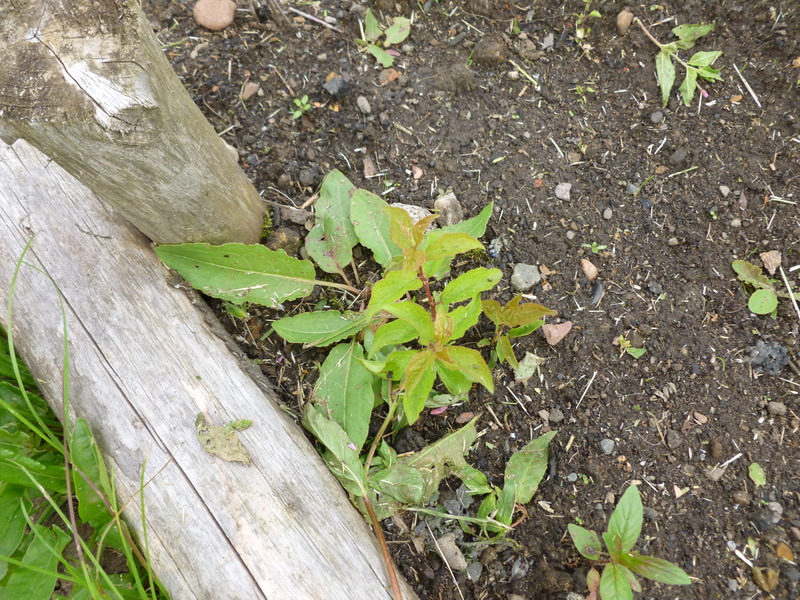 But the old man’s ghost must have been hovering over me at a garden centre a few years ago, and I came home with a bundle of hawthorn (crataegus) and blackthorn (prunus spinosa) (also known as sloe) seedlings. There’s nothing wrong with hawthorn as a hedging plant, except that the prunings puncture the tires of my garden tractor. Blackthorn is a different matter. 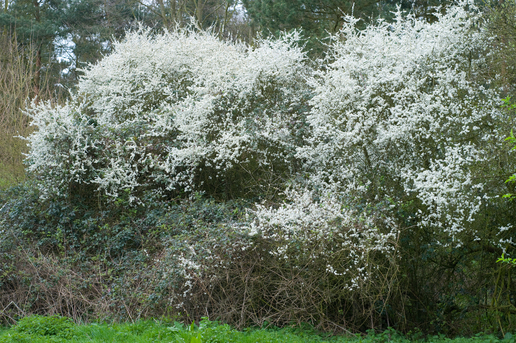 Here’s nature’s secret larder’s pictures of blackthorn in early spring. Looks wonderful, doesn’t it? And here is mine, a little later in the year. The new growth can be kept under control with a hedge trimmer. But nothing can keep control of these: I was too ignorant, and too impressed by Uncle Hamish’s love of thorns to do my research. Blackthorn makes thickets, and it does so by throwing out suckers. And these suckers are growing up through my raised bed of strawberries, at least eight feet from the hedge. And there are dozens of them! Yes, you can pull them out one by one, you can rub weedkiller all over them, you can curse the day you listened to your Great Uncle…nothing is going to stop this invasion. 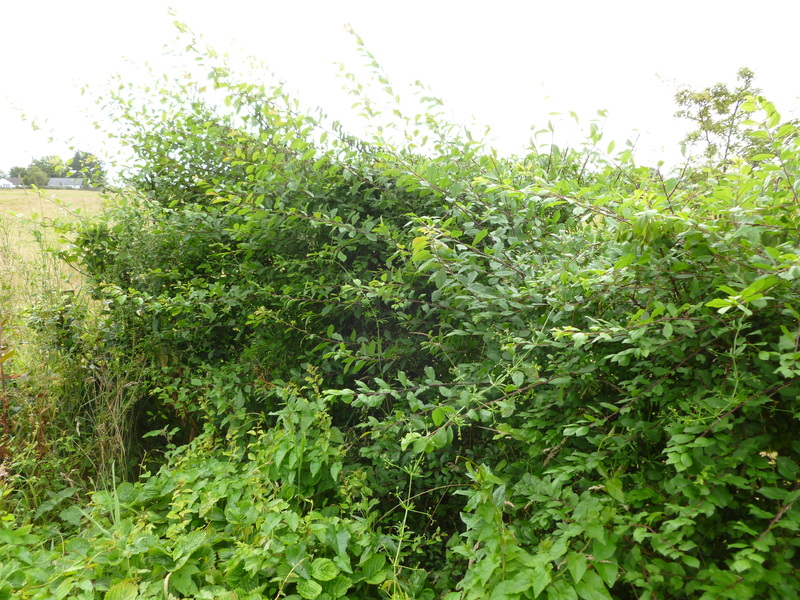 I think I am resigned to having a blackthorn thicket where I once had strawberries. Please, dear reader, never, never, think this will make a nice hedging plant unless you have several windy acres between it and the nearest thing you care for. This entry was posted in Gardening in Scotland by kininvie. Bookmark the permalink. Further, they say Blackthorn is dark and craggy and scary looking when leafless in winter (is it?) and, honestly, I am more than a little worried about the fashion in which it is moving in your strawberry patch. I think you should consult a druid, rent a backhoe and do a garden exorcism. Maybe in different order. Now Kininvie, we mustn’t shoot any messengers. I would recommend not meditating about killing the blackthorn while sitting beneath the blackthorn. And DO try to get all infected negative thoughts and emotional toxins adequately released before starting up the backhoe. By the way, are we sure she didn’t have anything to do with witches? I mean a girl who lit volcanoes in her own garden, at night! Hi Alberto – Yes, I’m back. Took a little longer than I thought, though. So glad that the hedge at the very bottom of our garden is Beech otherwise I may well have gone along with one of the favourites of uncle Hamish. I know it’s probably too late in your case, but dwarf flowering quince makes a lovely hedge. Hi b-a-g. I have flowering quince, but it grows very slowly with me, and would take a LONG time to make a hedge. But it’s a great idea, and if I can find a quick-growing variety, I must try it. There’s a huge thicket of blackthorn at the Priory – looks glorious in spring, really glorious but thankfully is imprisoned by the river on one side and the mowing of the meadow on the other. Blackthorn in your strawberry patch? Bad luck indeed. Yes, I fear the strawberries are a gonner. Are you quite sure that blackthorn suckers can’t travel underwater? It wouldn’t surprise me. Ah, that explains it. I wondered why you had to leave…. I hope you explained to your successors…. I have the rugosa problem too, but luckily it is on my bank, and relatively harmless.